And so I did and found the refunds page and read through it. Eventually, I clicked on their 'Contact Us' page and decided to fill up a form anyway knowing full well that it's a non-refundable ticket. 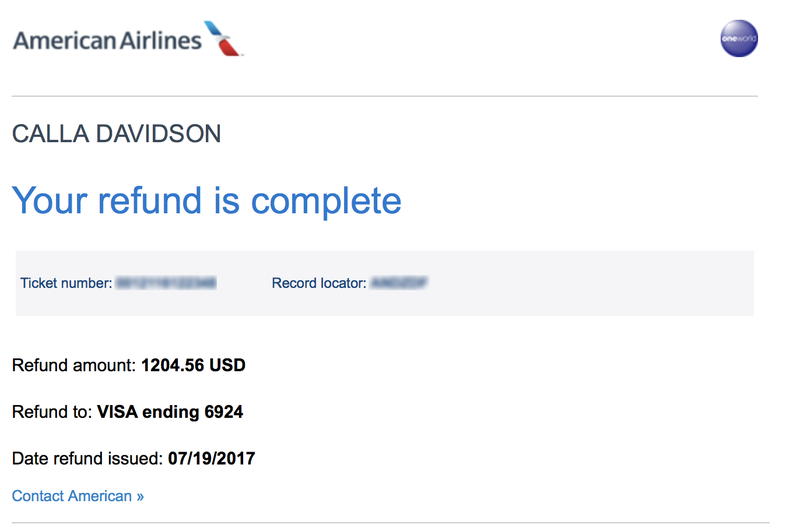 I explained what happened in full details and how it was an honest mistake that we overlooked the midnight flight timing, etc and just asked if any leg of my flight is eligible for refund. At this stage, I was just hoping that they could at least refund the returning leg of the itinerary considering that the new tickets bought was also on the same route. It doesn't make sense that I'm still paying for two tickets on the returning flight when only one person is flying. So I held my breath and clicked submit. Within a few hours, I received a response from a customer service representative at American Airlines with this response. I was estatic. 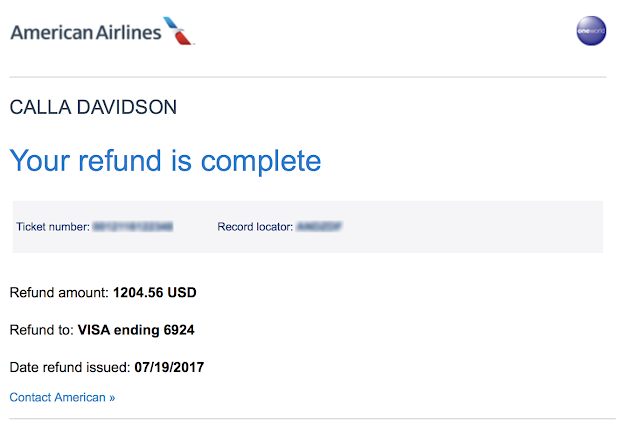 They didn't exactly state how much refund I was eligible for but either way, even if they did refund me a portion of the itinerary, it was still a relieve for my part that I did not need to bear the full costs of my silly mistake. It also did help that I did a bit of an online search for any similar experience with American Airlines and refunds and came across this post from The FIRE Guy who gave a really good breakdown on what he did to get his. 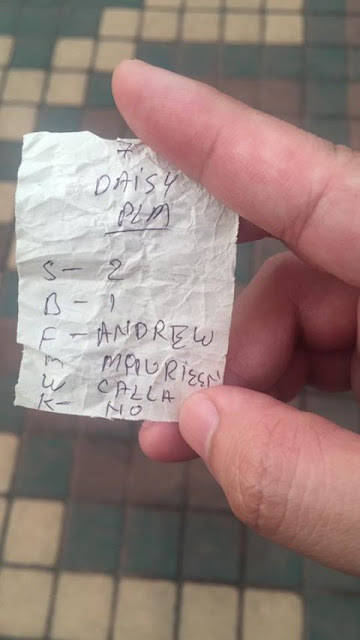 At this point, I felt I've got a really good chance. After waiting for about a week, I finally got an email from American Airlines. 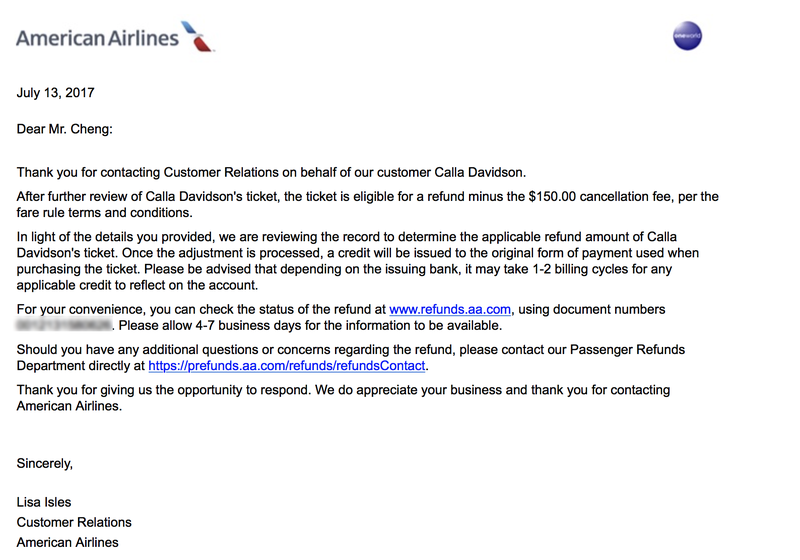 That's right, they refunded the entire itinerary minus the USD $150 cancellation fees. 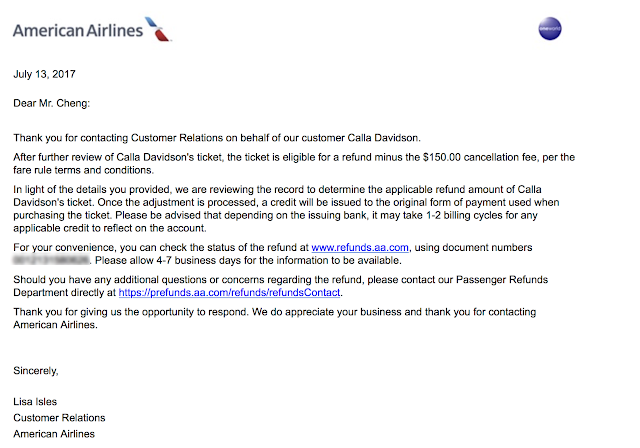 All in all, instead of bearing the brunt of losing the old ticket at USD $1,200 and coughing up money for brand new ticket at USD $1,800, with this refund, I only had to pay an additional cost USD $610. It's still money loss but still way better than paying USD $3,000 for a return ticket on an economy class! So an advise to y'all out there, if anything similar happens to you, there's no harm with emailing the company directly and ask politely if there is any way you can get a refund even if you're told that the ticket is non-refundable. Chances are - you might be eligible, unless if you're dealing with a budget airlines.